Because Alana use to watch Drake Bell and Miranda Cosgrove in the Nickelodeon show Drake and Josh when she was younger, I figured she might be interested in watching this next cartoon with her brothers. 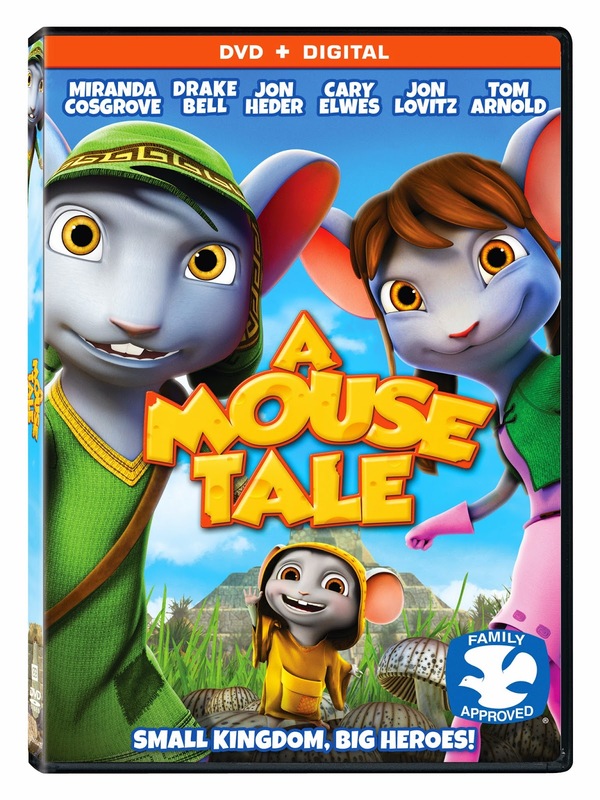 Arriving on Blu-ray (plus Digital HD) and DVD (plus Digital) February 10th, 2015, A Mouse Tale will star voices of both popular young actors in the new Lionsgate film. There will even be music by Brandon and Savannah Hudson from America’s Got Talent. The synopsis says "In order to save their kingdom from evil rodents, Sebastian (Bell) and Samantha (Cosgrove) are sent on a quest by the King of Rodencia (Jon Lovitz), and the wise Wizard Dalliwog (Tom Arnold), to obtain a legendary magical crystal, which has the power to defeat the rodents. With the help of two trustworthy knights (Carey Elwes and Jon Heder) they must venture deep into the forest and enter the forbidden world of giants in order to accomplish their mission and restore order to the kingdom. Alana was ecstatic when she heard the two voices she recognized! As for the boys, I don't think they were all that interested in it or at least as much as she was which is odd for my children. Declan was interested when it first arrived but not as much once we turned it on. I wasn't a huge fan as an adult but Dane loved the action. It reminded me of similar stories like Tale of Despereux with the plot of the smallest mouse being the hero. Recommendation: Alana seemed to really like this one more than the others and Dane was definitely into the action. I do have to say thought that the cost is fairly expensive for a movie like this and I probably wouldn't find myself making the purchase if I had the choice. Giveaway: Lionsgate is going to give one of A Lucky Ladybug's lucky readers a copy of A Mouse Tale on DVD to have of their own! I am most excited about this movie because I love mice!